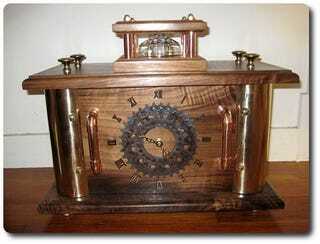 In a story sure to melt the gears in our brass-and-copper hearts, one steampunk fan toiled for weeks in his workshop in order to present his son with an intricate walnut clock as a wedding present. The best thing is, the son had been the one to introduce him to steampunk in the first place. The dad-humor in the note that came with the present puts an "aw shucks" smile on my face. To activate the dilithium power generator and set the clock, remove the large brass knobs and lift off the top. Caution, the generator itself is not a serviceable part. Do not remove the small brass nuts on top of the clock. If for any reason the power containment unit should become damaged or compromised in any way we recommend that you evacuate immediately, preferably to an alternate universe.